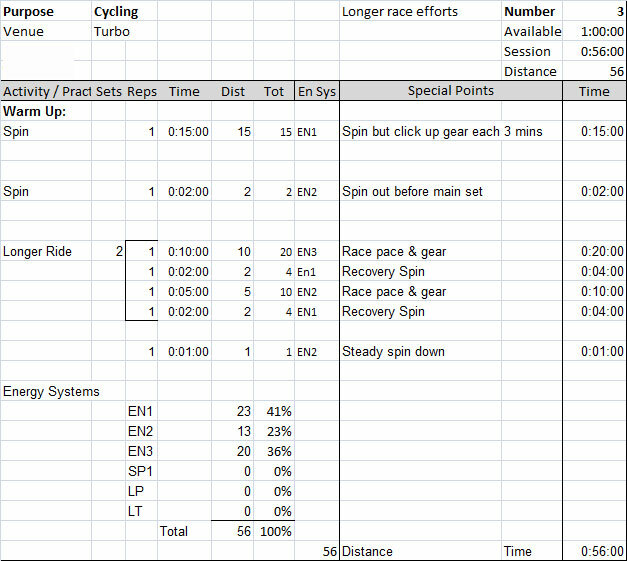 Weekly FREE professionally designed session plans in swimming cycling (Turbo) and running. Enjoy these sessions - and if you have any questions please feel free to email. The Single Arm Drill - Breathing to the Non Stroking side is sometimes called UNCO and is a great drill to aid rotation and delay the drive of your stroking arm until you have started to rotate back to the prone position. Keep your leading arm on the surface of the water with your palm facing the bottom of the pool while you breathe, then as you rotate back to the other side point your forearm and hand down to the bottom of the pool and accelerate through to your thigh, coming as close to your bodies centre line as possible. 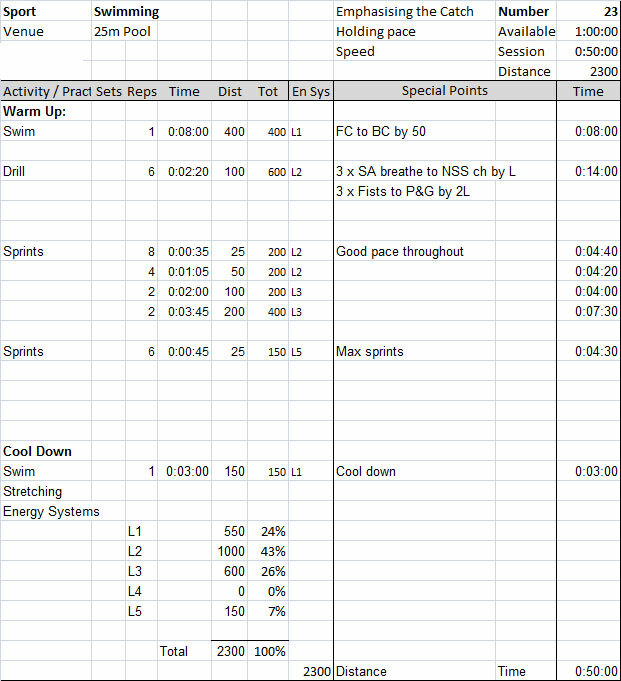 The main set should be done at a hard and even pace throughout. Times are designed to be testing, so you have little rest but are able to keep up a pace faster than your triathlon race pace. Try to make the 50's twice the time of the 25's etc. 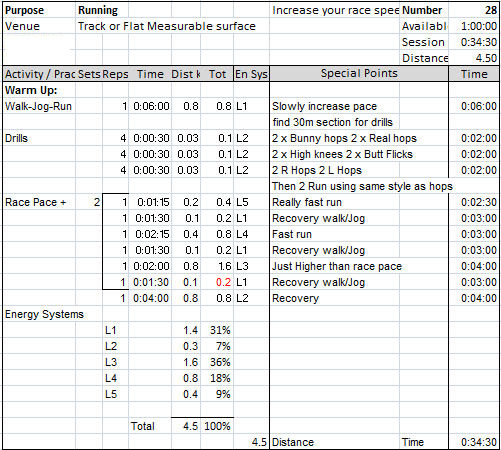 The final 6 x 1 length sprints should be faster than the main set swims. Practice easy speed by doing fist swimming to push and glide. When we talk of race pace and gearing you should not only be racing at your race intensity but should also maintain your race position on the bike. You often see triathletes on bikes with tri-bars not on the tri-bars and if there are no tri-bars they aren't on the drops. Getting used to these positions and comfortable in them will save you potentially minutes on the bike leg. The main set has 30 mins of race paced cycling but with recovery sections that should let you stretch out. Once these are done get back into the position and remain there for that segment. There's no doubt that to raise your pace in a race you need to raise your pace in practice, but you can't do that over your race distance. So this weeks session runs varying distances, from 200m to 800m, but all above your race longer distance pace. At faster speeds your form is often better than your long distance form and the training benefits are often greater than on long slow or tempo runs. The 200m is really fast, the 400 is fast and the 800m should be just above your race pace. Each has a walk / jog recovery in between them and the set is done twice. Try to be honest with your efforts.